WOW!!!! I love this release! Bizarro lays the listening pleasure thick within the track that spins reel to reel. Old Skool Bicasso for all the fans that dig it. Listen to it all the way through and not even notice. '2min. Touchdown' features PSC. DOPE. All tracks produced by Bizarro except tracks 4 & 7 by Nebulus. 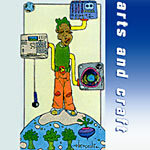 Cover art by Bicasso.